After the Portuguese government demolishes his slum and relocates him to a housing project on the outskirts of Lisbon, 75-year-old Cape Verde immigrant Ventura wanders between his new and old homes, reconnecting with people from his past. 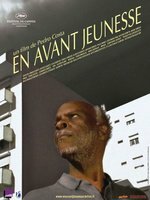 The final movie in Pedro Costa's Fontainhas trilogy, Colossal Youth follows Ventura after his housing development is demolished and his wife has left him. The two previous installments of the trilogy, Ossos and In Vanda's Room, are also on Criterion, and currently available streaming on Hulu. The narrative and the connections are fairly loose, though, so it doesn't ruin the story to watch them out of order. If, like me, you're curious about the balance of documentary and fiction in this series, this blog post (I suppose there's a 'spoiler' right in the blog title for something that happens behind the scenes, in real life, between two of the films) answers that question. In a nutshell, the first film, Ossos, was fiction, although the actors were all residents of Fontainhas playing characters like themselves. But Vanda Duarte and her sister Zita suggested to Costa that it would be less disruptive if, for the second two installments, Costa just filmed them going about their lives. So In Vanda's Room and Colossal Youth are much closer to documentary, with the actors playing themselves, going about doing modified versions of their normal activities. I rewatched this last night, and I still think I need to watch it again to put all the pieces together. The NYT review I think it was mentions some interview with Costa where he says a couple of the scenes are not contemporary to the rest, and I'm still not sure which ones. I thought I had one nailed as being from the past, but then they started reciting the letter, so I guess I was wrong. So I probably need to watch again to try to figure that out and see what else I've missed. But I am OK with multiple rewatches on this, because I love this movie, and I could and probably will watch it over and over. It's a slow, tragic, wrenching, and ugly-beautiful movie, and I keep thinking about it. It's much tighter and denser, really, than it seems at first glance. For all that time spent in seeming real time sitting in rooms with the camera barely moving, listening to someone tell a rambling story, it's really not spare. There are contrasts and little gestures and tiny little backstories going on all the time. It just kills me how you'll be settling into watching Ventura filmed from below so he's towering over you, looking authoritative and dignified and all that, but twice, when he's leaving somewhere well-tended, someone covertly wipes down the area where he was standing (the guy showing him the new apartment and the security guard at the museum), and you remember this is a desperately poor, dirty old man and that there are parts of his own world where he doesn't belong. I also watched the interview with Costa about the movie they have on Hulu, and he says that the burned out apartment in the new development toward the end, where Ventura and that other guy are holding hands, was one of the apartments they filmed Ossos (the first in the trilogy) in. The fire happened while they were filming Colossal Youth, so he worked it into the story. Which is horrifying but also really amazing. The series of contrasts throughout the whole movie sort of start to meet in the middle there, with the damage to the new apartment imbuing the walls with some of the history of Fontainhas. And, of course, that the trilogy started out in that apartment and then, accidentally, ended in the same place, but different. It's actually a horrible story about the fire--a dad set the fire in a failed murder suicide attempt apparently, so I don't mean to say Yay Fire or anything--but the way Costa works that into the story is brilliant. And thematically, it dovetails the melding of documentary and fiction as well. I just now found this article about the whole Fontainhas trilogy while I was looking for a cheat sheet, which is a really well done appreciation. It didn't have the answers I was looking for, but I'm glad I found it. And I would like to apologize in case I, like, killed the Criterion club by suggesting this. I knew it wasn't going to be a crowd favorite or anything, but I had not heard about people walking out in droves until I found those reviews to put in the sidebar. I knew it might be boring and kind of depressing for a lot of people, but I didn't realize it'd be that divisive. Please don't banish me.